An interesting tulwar restoration just landed on the bench. Having never done it before, I'm curious to know if anyone here has dismounted a tulwar hilt from the blade? Given that it's clearly fixed in the old, traditional manner using epoxy resin (no pin visible), will the simple application of heat do the trick? I've never taken a tulwar apart but old cutlery is attached in much the same way. I've held cutlery in boiling water and easily took them apart. that was the plan. Wonder if anyone has the "recipe" for traditional Indian resin/hardner?? Check for a pin an extra time, as they are often hidden in a decoration, and not easily seen. As Jens says, a pin is likely. You need to look centrally on the hilt level with the quillions. A heat gun should produce more than enough heat (If the resin is the correct original resin). I'd try using it on the low setting on the blade near the hilt and then see if you can wiggle the blade free. with luck you could reinsert the blade and reuse the original resin. But beware, if it was rehilted in recent years and anything like epoxy was used, it's going to be unaffected by moderate heat. Whatever the resin used is, I'd err on the side of caution and assume that the fumes will be wildly toxic! But without seeing what you are dealing with, it's difficult to give an informed opinion. Can you slap up some pictures for us? If you want to for whatever reason replace the resin, then avoid epoxy or anything similar. 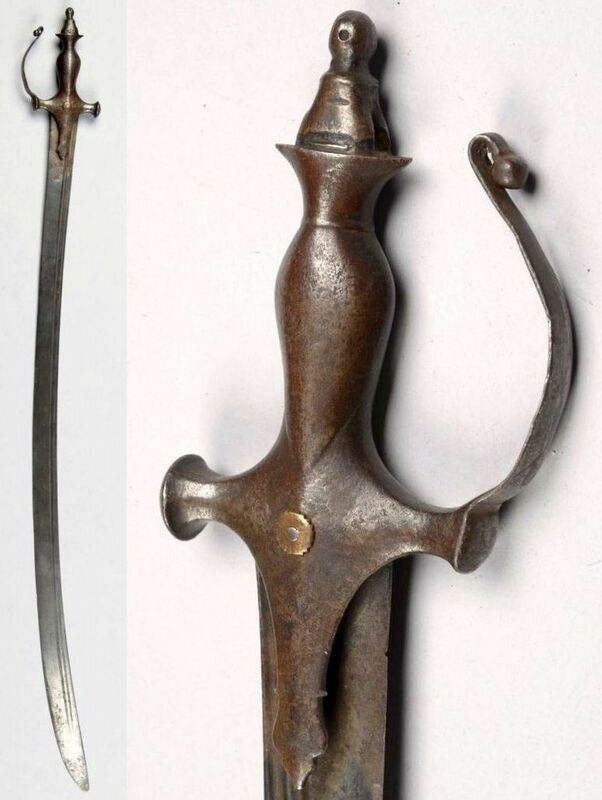 I regularly see tulwar with reattached hilts and the use of modern resin is a total turn-off. You can make your own 'cutlers resin'? here are a few pics. Missing it's knuckle bow and pommel disc. Handle is two-piece, brazed construction. No evidence of pinning apparent. 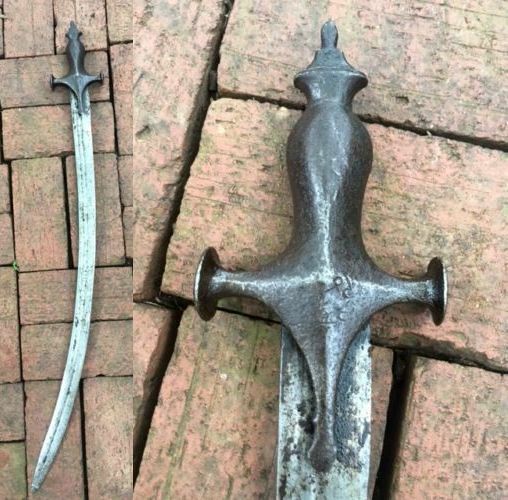 Since intact tulwar hilts are fairly common, complete replacement would seem to be the best course of action. Any sign of a pin? no sign of one. I might polish a "window" on the handle this weekend just for the sake of the exercise. Missing it's knuckle bow and pommel disc. What exactly is the reason for removing the blade from the hilt, is it loose? Is there any evidence that there ever was a knuckle bow and pommel disc? There are swords from other cultures that are similar to tulwar hilts, can you take a picture of the whole sword? As I'm sure you know, the resin looks original. I think that if the blade is worth cleaning up to any extent then I'd want a complete hilt. As you say the disk is missing. The knucklebow is a slightly different fish! I've got a tulwar with a fully silvered hilt where the hilt clearly was made with a bow, but it's been carefully removed before the hilt was covered in thick silver. So the bow could have been removed before the hilt was put on the blade. I had a couple of Tulwars marked to the Bikiner armoury that had similar shaped blades. I agree with you, new hilt is the way to go. I'd be interested to test the blade for activity as well. Try Ebay.IN for a hilt. It's the India Ebay and it's all in English. this is good advice ! Beware of the tulwar pommel disk thief!! perhaps indicative of a design weakness. Forge-welded pommels only bounce once.